The first phase of the redevelopment of Battersea Power Station will create a self-sustaining urban village and vibrant community in its own right. As well as the 850 apartments across 8 blocks, Circus West at Battersea Power Station will have a range of amenities and services that will make the exclusive location both a destination and a landmark. There will be a theatre, 35,000 sq ft of creative business studios and a 15,000 sq ft gym, pool and health spa. The main Circus West building, designed by Ian Simpson Architects, snakes along the western edge of the Power Station, wrapping its art deco industrial splendour in a reflective glass skin. Here's what's been said about the exciting London apartment development at Battersea Power Station. 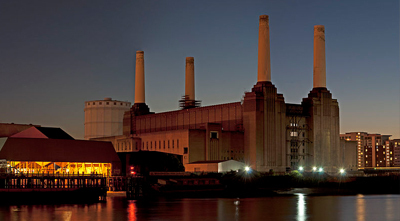 Future phases of Battersea Power Station redevelopment are planned for the site. The Circus West Village Hall will create a beating heart in the centre of Circus West. Village Hall will be created in partnership with The Battersea Arts Centre.